Located: Approximately 1.25 miles south of S.R. 84/595 on west side of Nob Hill Road. The elegant gated community features a rustic stone guard house which overlooks a cascading waterfall shaded by oak and ficus trees. Long Lake Estates was carefully planned for extra-spacious homes. There are 7 different models, 5 single story ranch style and 2 two story models. 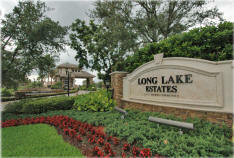 Long Lake Estates has a dedicated community recreational park exclusively for use of its homeowners. Amenities include a children's playground, two tennis courts, a basketball court and picnic pavilion. Recreational trails for horseback riding, biking, walking and skating wind gently around the community's perimeter. Nearby is tree Tops Park which is a 356 acre recreational area including nature trails, canoeing, fishing, playgrounds, picnicking and a 3.5 mile dedicated equestrian trail. If you are looking for a home for sale in Long Lake Estates call Ski as he can certainly show you any listed home in Long Lake Estates, and we usually have a list of homeowners who are interested in selling their home but do not have it listed. 3,062 a/c sq.ft. - 4,019 total sq.ft. 3,461 a/c sq.ft - 4,475 total sq.ft. 3,557 a/c sq. ft. - 4,469 total sq.ft. 4,811 a/c sq.ft - 5,837 total sq.ft. 4,080 a/c sq.ft. - 5,687 total sq.ft.